Kärcher Futuretech GmbH develops, manufactures and markets reliable products for rapid deployment missions in disaster areas and complex emergencies worldwide within four fields: water supply systems, CBRN protection systems, mobile catering systems and field camp systems. As a wholly-owned subsidiary of the traditional, family-run company Kärcher Futuretech is obliged to its corporate social responsibility for peace and humanity in addition to environmental protection and puts a great effort in developing sustainable, eco-friendly systems and manufacturing them with satisfied employees and in respect of our nature. 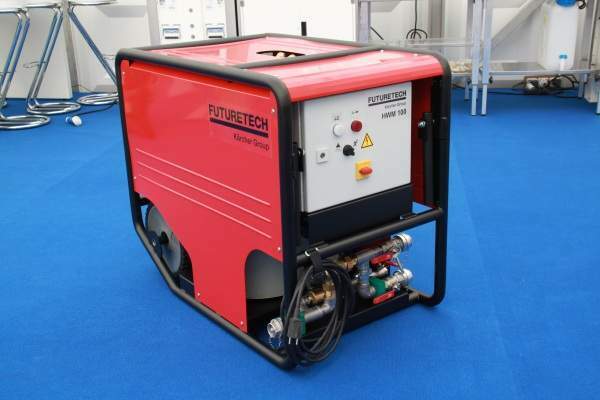 Futuretech has an annual turnover of approximately €40m and more than 100 employees. Kärcher Futuretech GmbH is a worldwide leader in CBRN protection for both military and civilian applications. We provide a comprehensive system consisting of decontamination equipment including decontamination devices, modules and systems, as well as chemical, biological, radiological and nuclear (CBRN) decontamination agents. 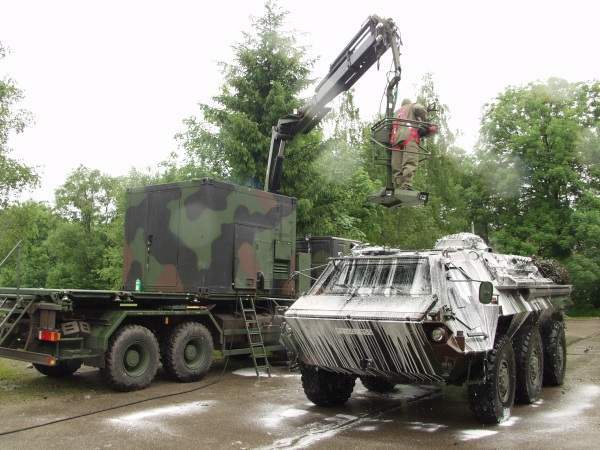 Futuretech products facilitate a prompt and effective decontamination of people, tanks and other vehicles, air and watercraft, personal weapons, clothing and equipment and sensitive material. Futuretech offers customer-designed solutions in accordance to specific customer requirements. 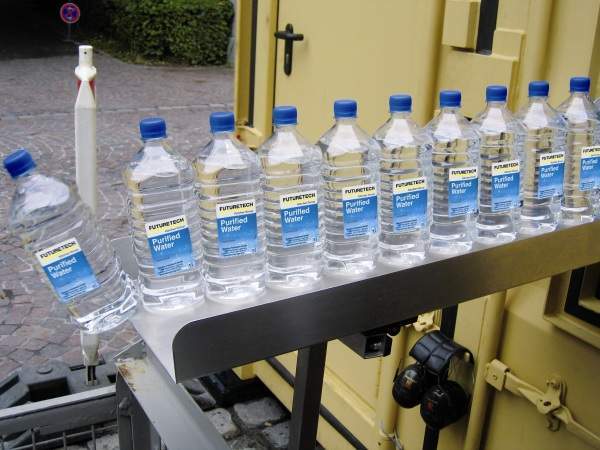 To fulfil the basic need for drinking water Futuretech has developed a range of mobile purification systems. 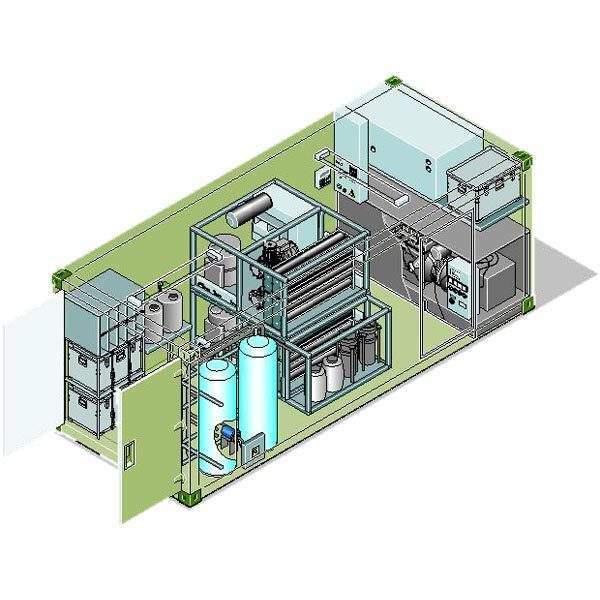 These systems are able to desalinate sea and brackish water and produce drinking water out of nearly any water quality without the need for chemicals. 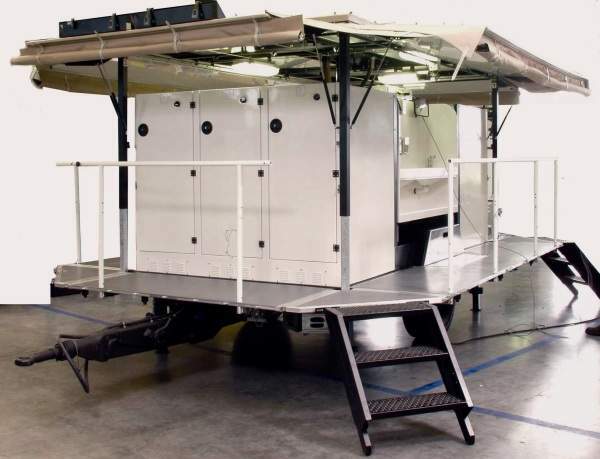 The systems can either be mounted on trailers or installed in containers in accordance with specific requirements. Futuretech has also developed mobile water bottling plant and packaging system to provide drinking water in the field. 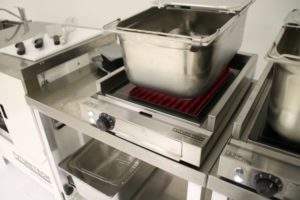 Futuretech has developed a range of highly mobile and flexible catering systems which can be transported to even the most remote of sites. 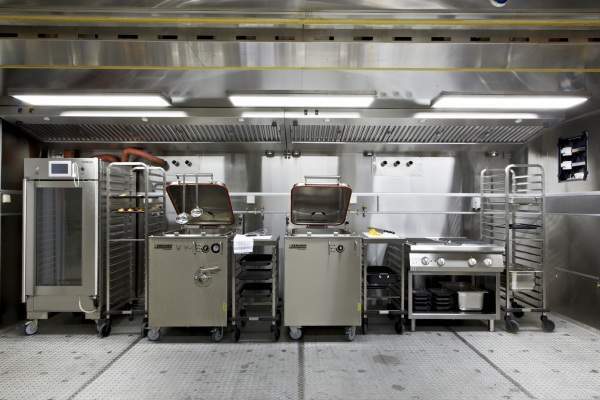 Ranging from individual cooking modules over field kitchens to container kitchens, all catering systems are designed for transport by road, sea and air. 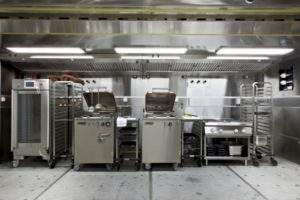 Each kitchen’s burner is fuelled by diesel, gas, heating oil or kerosene. 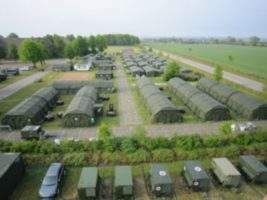 Futuretech’s range of field camps are deployable military facilities which – after a short assembly time – provide living and working conditions similar to those in the soldier’s home country during an extended period of deployment abroad. These systems promote the well-being of soldiers and task forces and enhance their morale and motivation. 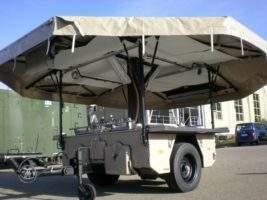 The Kitchen Catering Container KCC 500 offers wide-ranging scope for equipment with the kitchen cooking devices (such as the Combi Steamer KCS 15 MF) and supplementary equipment such as work tops with base cupboards, to provide three main meals and beverages on a daily basis for as many as 500 personnel. This degree of variability is not restricted to the devices themselves. If required, instead of the highly energy efficient, low operating cost liquid fuel burners, kitchen cooking appliances can be selected which create heat by electricity or gas. 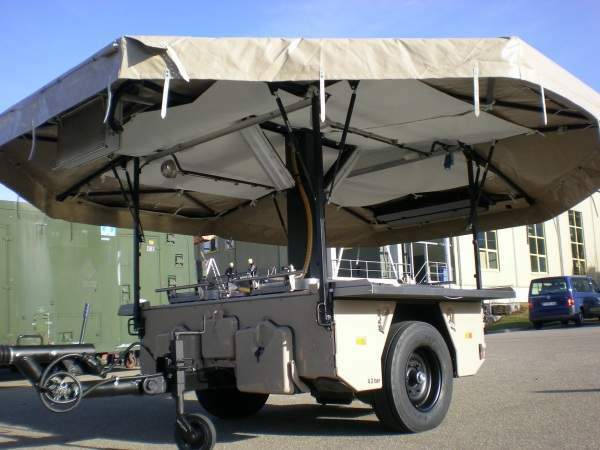 The TEP 90 is a highly mobile, rapidly deployable decontamination system for mission-optimised thorough CBRN decontamination close to contaminated mission forces. Due to ‘state-of-the-art’ decontamination technologies and agents, it meets all relevant technical requirements of a high-performance decontamination system. The modules/components used in the individual decontamination modules are primarily based on the proven technology used for CBRN defense within the NATO and other military forces and also in special areas of industry. An 8×8 cross-country vehicle with all-wheel drive and an armored driver’s cab is used as the transport vehicle so that it can be used off roads and paved roads under all weather conditions. The WBP 1300 – Water Bottling Plant is designed for fully automatic production of bottles from plastic preforms (food quality PET) followed by filling with chlorine-free drinking water. The impressive feature of this system is its rate of production. A WBP 1300 plant can produce up to 26,000 bottles per day of operation, or 9.1 million bottles per year. This leads to a considerable reduction in logistics expense among other things, as only preforms have to be transported, rather than large bottles. 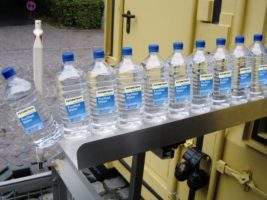 The microbiologically superb quality of the bottled drinking water, even under extreme conditions of mobile use, has been confirmed in recent years, when Futuretech systems have been used to fill millions of bottles produced in the field under strict supervision. After only twelve months of construction, in mid-October Kärcher Futuretech GmbH officially opened its new head offices, with a surface of 4,000 sq mts in the Schwaikheim industrial estate. Winnenden – At IDEX (International Defence Exhibition), the largest exhibition in the Arabic region, held in Abu Dhabi, the United Arab Emirates, Kärcher Futuretech presented a large variety of products from its 'systems for peacekeepers' range to its customers and the public.